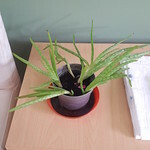 Aloe Vera has been planted 8 times by Growstuff members. 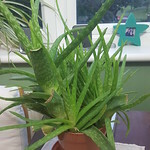 aloe vera is rapidly becoming my favourite unkillable plant, taking over from spider-plants because not only does it seed everywhere, survive me forgetting to water it for weeks, survive me over-watering in guilt when I remember, and not appear to care whether it has sun, shade, accidentally left on top of a radiator or shoved in a utility room with no heating, but unlike the spider plant, it also does something useful other than providing greenery in your house. 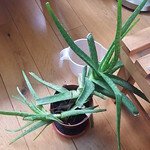 Top spas keep advertising aloe vera beauty products, but I have the pure stuff whenever I want, just by breaking off half a leaf. It's very soothing on burns, which was useful after I dropped half a saucepan of boiling water on my foot the other week. 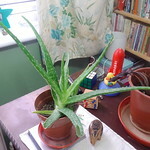 Sign in or sign up to track your aloe vera plantings. Cesy harvested 1, weighing 0.5 oz. Cesy harvested 2, weighing 0.5 oz. 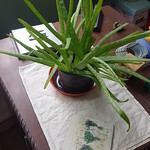 Sign in or sign up to track your aloe vera harvests.